Will demonetisation be a vote winner or loser for Prime Minister Modi? He has captured the moral high ground: many voters view him as the only politician willing to crack down on black money. He fared well in last week’s byelections. But implementation has been badly bungled, and will hit economic growth for two or more quarters. In a worst-case scenario, this will mean a serious recession. Voters willing to tolerate temporary travails could turn savagely against Modi if a sinking economy crushes employment. Without new reforms, demonetisation cannot kill black money, which will soon boom again. Yet Modi could emerge in total triumph, by combining imaginative accounting, populism and good economic sense. Almost Rs 15 lakh crore of high-value notes have been demonetised. Much of this will legitimately be deposited or exchanged for new currency notes. Many black hoards will be laundered at a discount, using middlemen to get through the bank accounts of the poor. Many people queuing up to exchange notes are being paid to do so. 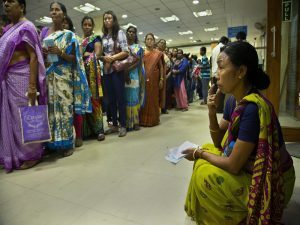 Jan Dhan accounts have suddenly swollen to Rs 64,000 crore. In the accounts of the Reserve Bank of India, all outstanding currency notes are listed as its liabilities: the RBI is liable to pay every holder in smaller notes on demand. If Rs 3 lakh crore of notes remain un-encashed at December-end, this implies a corresponding fall in the RBI’s liabilities, giving it a huge windfall. This windfall can be written back into its profit-and-loss account as pure profit. The RBI may want to keep some of the windfall for contingencies. But Modi can demand — and the RBI governor will surely agree — to hand over almost all the Rs 3 lakh crore to the government as a special dividend. Maybe the un-encashed proportion of high-value notes will be only 10%, not 20% as assumed so far. That will mean a lesser bonanza of Rs 1.5 lakh crore. That will still suffice to put Rs 5,000 into every Jan Dhan account, and leave Rs 25,000 crore for other uses. For two years, opposition parties have sneered that Modi has not implemented his election promise to smash black money and distribute it to Indian citizens. But now Modi can fulfil his pledge. He can legitimately say the extinguished notes represent cash clawed back from black money holders, and boast that he is now distributing this to the aam aadmi. Voters will cheer resoundingly. This will be a political triumph. Opposition parties could argue this is not black money brought back from abroad. They could dispute Modi’s creative accounting, or even move the courts. But from a political viewpoint, opposition parties will look silly opposing a plan to benefit hundreds of millions of voters. Regardless of the technical or procedural objections of opposition parties, Modi will triumph politically. Some critics will call this sheer populism. Very true, but so what? It will also represent good policy to rescue the economy from the recessionary trends caused by bungled implementation of demonetisation. Sector after sector of the economy has reported dislocations of transport and value chains, sharp declines in sales, and widespread non-payment of dues. GDP growth will take a significant hit. The situation cries out for a stimulus to revive demand. Putting lakhs of crores into bank accounts of citizens will provide the classical economic remedy of a big demand stimulus. Poor people spend money fastest, so stimulating demand via Jan Dhan accounts will be good policy. The growth shock of bungled demonetisation can soon be offset by a consumer spending boom. What could go wrong? Will the RBI governor say no? Will all outstanding notes get exchanged, leaving zero gain from non-encashment? That’s very unlikely. Watch out for a big Jan Dhan stimulus in the coming budget, maybe sooner. I am flabbergasted by the naivety shown by you in your article. How happened to A. Aiyer of the past who use to make me think, understand & enlighten. I cant believe you are same author as 10 years ago. Ignore me as zealot & you have one less reader – as if you care – for now.